I promised a few customers at Wonderwool that I’d do a post about washing fleece. Better late than never. They say there are many ways to take a pelt from a feline and there are probably just as many ways for washing fleece. It’s interesting to notice that us fleece spinners all have our pet methods and if what you do works for you and you get good results, that’s all that matters. A raw fleece is a dirty fleece. I’m sorry for those who love the smell of sheep and raw wool but seriously, there’s a lot of crud in there, even if you can’t see it. Some spinners do like to spin raw fleece unwashed and if that floats your boat then fine. I personally don’t really like the smell of sheep except when I’m cuddling my daft rogues and I don’t really want it in my living room permanently and because I handle my sheep on a regular basis I do know how greasy and dirty they are even when you go to great lengths to keep them clean as I do. Dirt on a sheep’s fleece however is made up of different things. Firstly there is the obvious. Dung, poop, caggles, dags, other words I’m not going to print here – sheep get dirty bottoms for various reasons, sometimes it seems like a never ending job keeping them clean all year round. You shouldn’t wash fleece that has obvious chunks of the brown stuff in it, you are wasting your precious time, if there are chunks of poo on the fibre in the water you will rinse it till Kingdom Come and the water will still end up looking like Builder’s Tea. Get good fleece to start with and skirt it properly before washing. That means removing all the bits you know you don’t want there or won’t spin like poo, mud, bits of twig, short pieces of fibre, course tough wool from the britch (hind end) and round the brisket (chest area) and where the fleece ends at the legs and turns from yummy fluffiness into skinny, hairy, comical, knobbly kneed sheeps legs. If you’re working with fleece you’ve bought from me, none of that should be in there. I skirt aggressively on the sheep as I shear them and again when I weigh and pack fleece. I can’t guarantee there won’t be the odd stray bit of something in there but you shouldn’t need to skirt as with conventional straight-off-the-sheep fleece buying. Other substances on there you don’t really want include; mud if the weather has been bad, suint which is sheep sweat basically and vegetable matter (VM) which can be bits of hedge, baler twine (yes really) straw, hay, seeds, burrs, sheep breakfast… And the odd dead beetle too. VM has to be picked out or flicked out. You have to use common sense with this. If it’s a twig or bits of straw you can see and pick out then do it before washing. Sometimes once the fleece is clean and dry and no longer greasy then some kinds of VM and scurf can fall out more easily than they would do raw. The final thing in there which you may or may not want is a matter of personal taste. Lanolin. 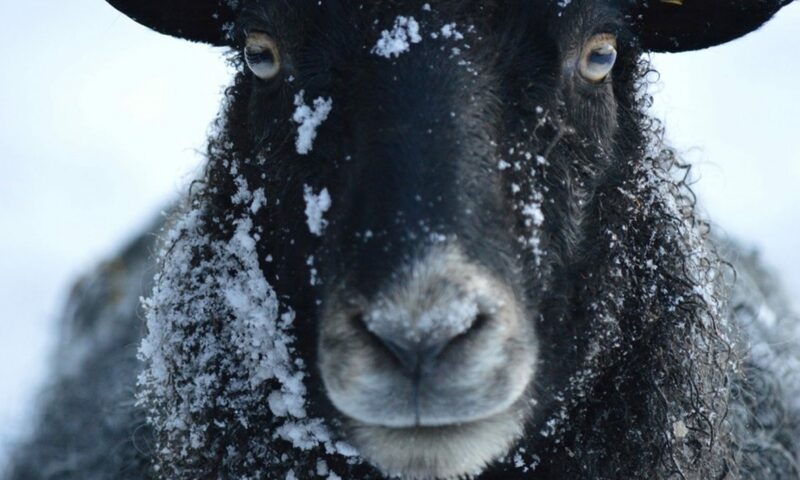 It’s basically the grease or wool fat that sheep produce to weatherproof their fleeces and helps to keep them more cosy by helping to shed rain. It’s a waxy substance secreted by the sebaceous glands in the same way that hair mammals (ourselves included) produce different kind of oils from the sebaceous glands in our skins. Lanolin is a valuable substance both to sheep and mankind. Whether or not you want to spin your fleece “greasy” or not is entirely up to you – personally I don’t like a “greasy” fleece. But neither do I want to strip out all the grease because that leaves a harsh, dry, somewhat lifeless fibre behind which isn’t nice to spin and doesn’t look so lively and beautiful either in the fibre or in the spun yarn. 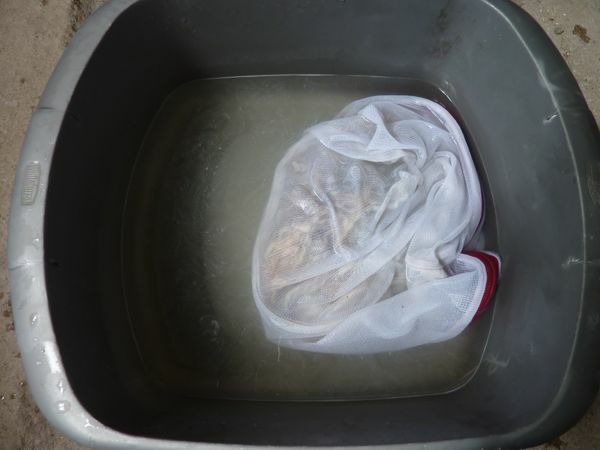 The way I wash fleeces is performed so as to remove as much dirt as possible and a reasonable amount of the grease. The resulting fibre is soft, silky, pleasant to handle and is left smelling faintly and pleasantly sheepy rather than honking of things you’d rather not share your personal space with. And trust me, your family won’t want to share their personal space with honking sheep smells either. So… back to the heat, moisture, agitation felty thing. Obviously we need moisture to wash it. To remove lanolin if that’s the goal we need heat too because this is a wax and needs to be melted as well as needing a detergent to bind with the grease so it can be washed away. That means we have to be super careful to avoid the third thing. Agitation. On it’s own, hot water is fine. Start swishing it around or dunking up and down like you’re trying to unblock the sink (which you’ll probably need to do after if you wash fleece in it ;0) and your lovely locks will start to hang together till death them do part. The best way to limit agitation/friction/movement is to contain the fibres so they can’t move around too much and so that you can handle them more easily. The best way of doing this is to use a mesh laundry bag of the type you might wash delicates in. What did you say? Yeah I don’t wash delicates like that either but I DO wash fleece like that. Nothing is so delicate in laundry terms as a delectable fleece lush with promise. Laundry bags are cheap. Really, really cheap. Get yourself one, or better still several, and make sure they are the small kind not the huge ones you could fit a couple of pairs of jeans in and still leave room for bathing the dog as well. 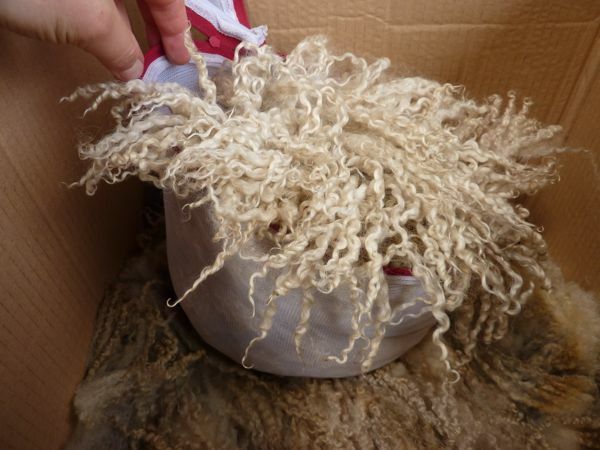 It is better by far to wash fleece in small sections than to turf the whole fleece into a tub. Trust me. I learned this the hard way. Felt football anyone? So, we have our laundry bag/s, we have our beautiful fleece with all the unnecessary bits removed. Pack the laundry bag so that it’s nicely plumped up but not rammed full. This isn’t pure Gotland by the way, it’s a Gotland cross but just as feltable. If it’s stuffed like a teddy bear then it’s harder to get the middle bits clean. You want it full so there’s not a lot of movement but so that the crud can get out past the fibres. Like so. Now the first stage for washing fleece for me is a cold water soak. This is something I learned to do from my friend Donna who keeps Polwarth sheep (one of only two flocks in the UK). In fact, I think I probably learned everything good about washing fleece from her. Thanks hun! ;0) If you soak the fleece in cold water it softens and dissolves an awful lot of the muddy/pooey element of the dirt which is the bit you want most rid of and just sitting there in cold water it is not going to do any felting at all. Leaving it over night is great. If all you can manage is half an hour in cold water then that’s better than nothing. Really. I use old washing up bowls for fleece washing. It means I can wash fleece outside or in the barn by the drain. I wash a lot of fleece so this is quite significant. The house stays clean, mum stays happy and I don’t run the risk of clogging up the drain with stray bits of wool. 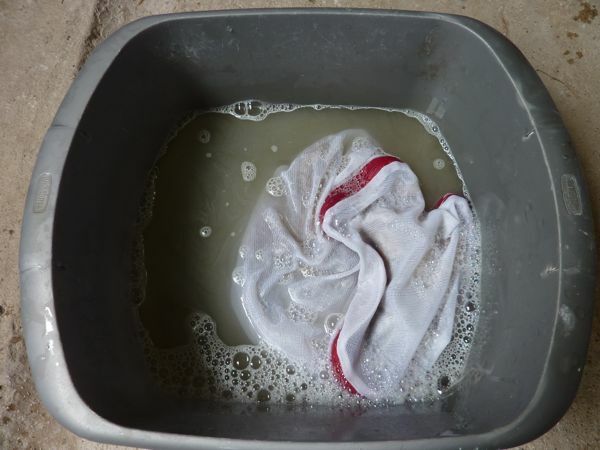 You can wash fleece in your sink or bath (clean it properly after, sheep can carry a number of organisms you might not want to share a bath or meal with) but if you have the space outside it’s just easier to wash in bowls. If you have a bad back and can’t bend easily, use a table outside, a wall, a workbench to raise the bowls to a comfortable height. That, my friends, it what is called Sheep Tea. And whilst you really, really don’t want it on your spinning wheel, clothes or hands, it is wonderful for watering your plants with. So far so good, We’ve got moisture but no heat and therefore no felt. 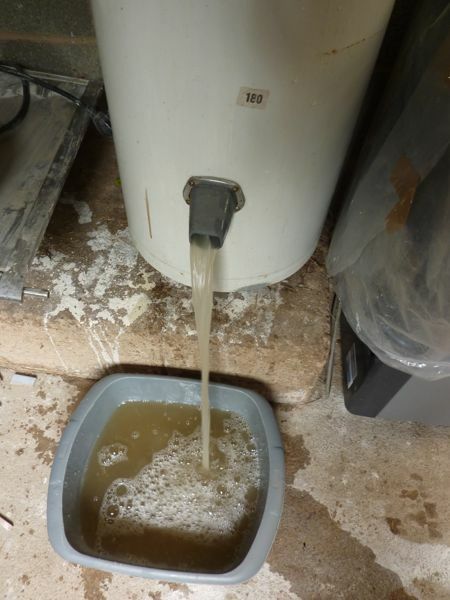 But we have to start handling wet fibres and Agitation is rearing it’s ugly head. Truly the best way to get the water out of this is centrifugal force. A spin dryer is the best tool a fleece lover can have. 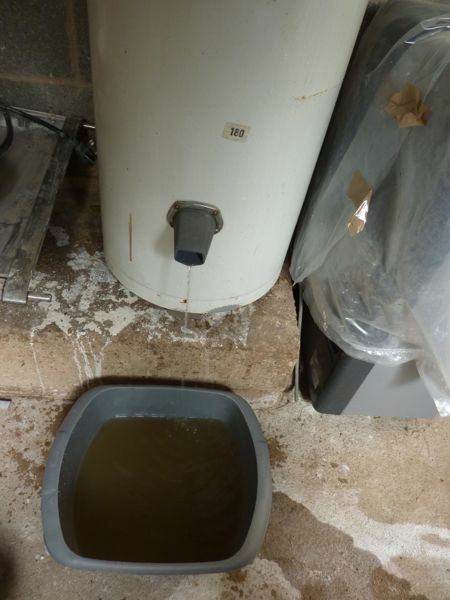 If you have nothing suitable to hand for spinning the water out then either just lift it out carefully and leave it to drain over a rack or gingerly press the water out but really you do have to be careful. Press or squeeze, don’t wring it. If you want to spin clean “greasy” fleece this is all you really need to do. Once it’s dry you’re ready to go. Have fun! For the rest of you please step this way. Lanolin melts in hot water as we discussed above. I use water at a temperature I would wash my dishes in. I don’t use a thermometer but I know from our data display that the best results come when the hot water is between 50-60 degrees Celsius. 60 C is pretty hhhhhhot to stick your hands in for a long time so 55 C is good. Hot enough to melt the grease, not so hot it strips the fibre dry. You also need detergent and you can use whatever you have. I use Ecover quite a bit because it’s what we use on our dishes and it’s there but Fairy is good for degreasing and cheaper and cheaper still are supermarket own brands. Others may disagree but I really don’t think it matters an awful lot which brand you use. At this point I should probably say that if you are washing merino fleece or other merino based breeds such as Polwarth then you would probably need to use more detergent and you will need really hot water – merino is chock full of lovely lanolin but you do want it gone, if it hardens on the fibre it becomes tacky, hard to spin and also hard to remove once it’s gone rancid. 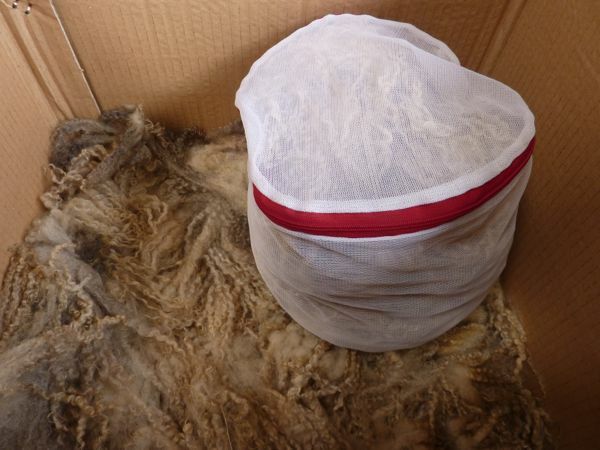 For these fleeces it really is best to degrease quite well at the first stage, especially if you’re planning on storing the clean fleece rather than spinning it right away. Hot water and a good glug of detergent. 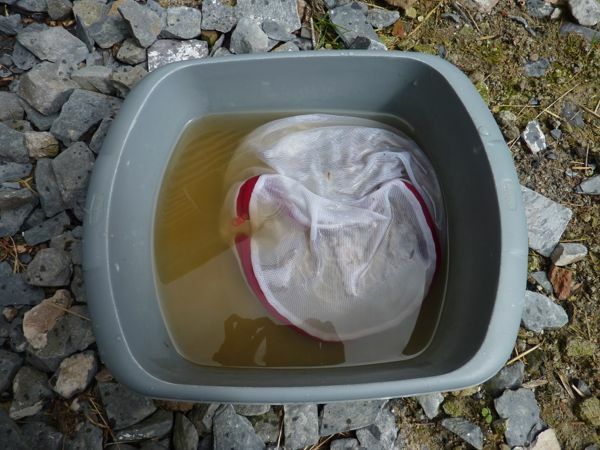 Put your fleece bag in and leave to soak for around 10 minutes. 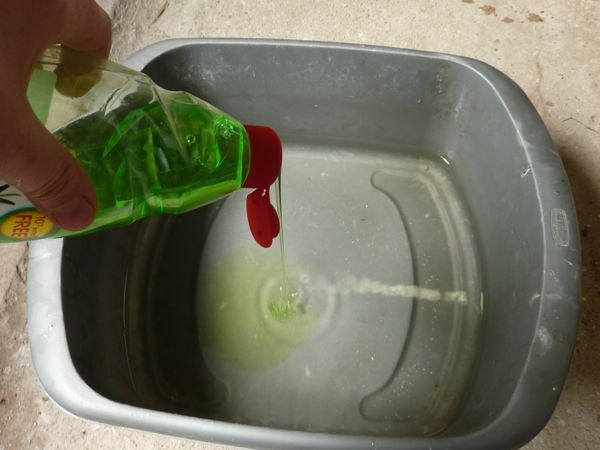 You want the detergent to get working but you want the water to stay hot so that when you drain it, the grease goes down the drain with the hot soapy water and doesn’t recoat the fibre as it cools down. Think of it like butter on a dirty plate. If the washing up water is hot then the plate rinses clean, if the water is cold then no amount of rinsing will take the greasy smears off it. Notice that although the water is murky and a little brown, it’s not really like sheep tea is it. There is still some muck floating out of this fibre though. Lift it out and place in the spin dryer/salad spinner/wire rack and spin or drain the dirty water away. Hmmm…. still pretty gross huh. You can use this for watering plants too once it’s cooled. In dry spells when your soil is parched the traces of detergent act as a surfactant to break down surface tension and help the water soak into the soil. Neat. Run another bowl of hot water same temperature as before. You can always go hotter with water but don’t rinse in cooler water because this will shock the fibre and, yup, that causes felt too. I tend to do one detergent wash only and then one or two hot water rinses depending on how clean I want the fibre or how dirty it was to start. So it’s not dirty any more but you can see the white cloudy swirl of emulsified grease coming off the bag now. That means there is still some “clean” grease there but that’s good, we want a little grease left behind to act as a kind of conditioner. For me, this is good enough. Either I’m going to spin it like this or I’m going to dye it and the further acid and heat from dyeing will clean the last bit of grease out anyway. So into the spin dryer again and spin it till no more water comes out and then I take it out of it’s bag and put it to dry. Drying fleece is best done away from direct sources of heat. The scales on the wool fibre shafts are lifted by the hot water washing and heat from a radiator, stove or direct sun will exacerbate this and make it feel harsh to handle. I dry mine over large wire racks, sometimes outside if it’s not too windy, sometimes in my polytunnel if rain threatens and sometimes in my house. If it stays damp for days then it will start to smell musty. Use initiative and get it dry within 24 hours but don’t bake it. Before and after shots. 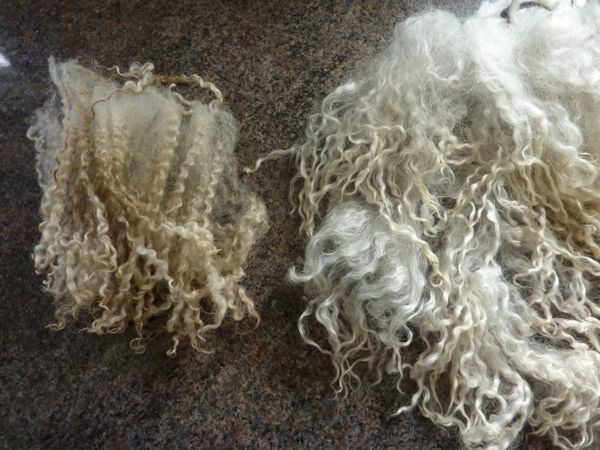 Raw fleece on the left and the washed fibre on the right. It does show how much difference careful washing can make, the clean fibre is silky and soft and opens up easily and will be a dream to spin. And it really wasn’t that bad was it? Enjoy! Thank you for this detailed,useful and funny article about fleece washing.I have brought with me to France some Gotland from your sheep Isabella.It was already beautiful before washing( and very carefully prepared), I’ve started washing it and it is really gorgeous with a nice silky colour .I’m very pleased, all the more so as Gotland is so difficult to find in France.